Shortly after I recovered from my illness, one morning the rumour spread, “The guards have left.” We tumbled out of our squalid huts and, true enough, for the first time in memory there was no armed guard in the lookout box above the wire. We went absolutely wild, whooping and shouting with glee. People poured out of the compounds to the spine road and soon a party had scaled the wire and was on the outside road. It was short-lived, for suddenly shots were fired and down that very road came a mobile column of German soldiers. The Commander lined a machine gun up for a burst but the escapees were up and over the wire like monkeys back into the camp. We knew only too well what a short fuse the German army had. Only two days before, some deranged soul had made a run at the main gate, of all places, and had been shot dead. We stayed in groups by our huts, and many army groups with guns passed the camp, but no tanks. Later that day a cheer went up as the first Russian tanks appeared. They paused at the camp and their officers came into camp and immediately sorted out the Russian section. Rumour had it that they were immediately armed and sent to the front, but who knows what happened. There was no communication at that time; they just swept past the camp but left guards at the still locked gates. However, in some of the compounds, some of the ‘kriegies’ tunnelled through the wire and made their escape. This was known to the Russians, as some were picked up, and the word came from our seniors that we had to stay put for the present because anyone found outside could be easily shot or sent to refugee compounds without identification. The Russians had a big identity parade, interviewing us all separately. Mike Bzowy was very useful to them as an interpreter. They were originally using a French-speaking Russian and a French-English German. He was able to speak Russian and several other languages too. After several days of this work he was talking to one of the Russian ladies, and she said that they were so pleased with him and they were short of his skills so he was going to be greatly honoured by being sent back to Russia to help with interpreting. He exclaimed to her how pleased he was with this honour, hurriedly came back to the gang, shaved his moustache, changed his clothes and buried himself among his comrades. we were bitten badly by bedbugs, so left there hurriedly. I used to mooch around the garages, with my fascination for all things mechanical. There were no-goers though. The Russians had played bumper cars with everything they could find. They were very backward Mongolian types. The smart units were only used as spearheads and the rubbish came along behind. We saw them with looted cars and even push bikes. They had no idea of how to ride or drive and gave no thought to life or limb, speeding down the road outside the camp and going full pelt into trees or water towers. They also tried to loot our quarters, and actually took several rings and watches. On complaining to one of the officers, some of the men pointed out one of the looters. The officer found he had about six watches round his arm. He gave them back to the complainers, drew out his revolver and shot the little Mongolian dead on the spot. True!! His pals just picked him up and carried him off. We got to Brussels in a very bouncy Dakota, two of the ‘kriegies’ on each side of me were sick as dogs, which did not impress me much about travel in a Dakota. I forgot to mention I had a couple of traumatic experiences whilst in Halle, and I was lucky to have good mates like Brownie and Denny. I woke up one morning completely out of it, I was convinced I could only eat if I got a coupon to exchange for the meal and was full of other fancies. Thank goodness they went along with me and did not pooh pooh my ideas, but just gradually talked me back to normality. I had another blackout on the train to home from the reception camp and worried my parents very badly as I did not turn up when expected. That time I came around in York. I must have got off the train when I saw the sign. To this day I don’t know what happened between then and eventually coming round in York town with all my bags and baggage, including the typewriter. The next clear memory is getting off the bus in Beamish and struggling down the road to ‘The Poplars’ and my tearful welcome. I never saw any of my dear pals again. Denny was shipped back to Australia quite quickly. 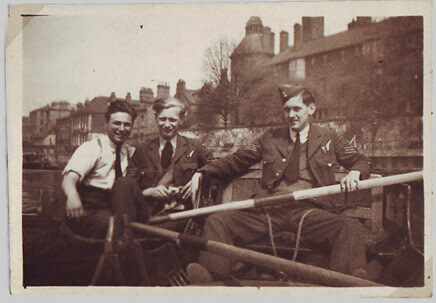 Brownie Masdin and Ed Downing wrote to me from London and I went down and met them in the West End and we all got very drunk, too drunk even to say all we wanted to say to each other. They were going back to Canada the next day. The little Welsh lad, Derek Lewis, came up to Beamish and stayed with me during my leave, he was going to leave the Air Force and emigrate to Canada, where he had relatives. 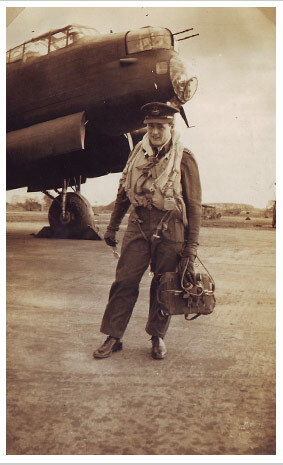 I had 6 weeks’ leave, then a week in rehab camp at Stamford Bridge before being posted near home at Woolsington Airport. There I got a cushy job in the transport section, which lasted until they closed the station early in 1946. From there I was sent to Tern Hill MU near Market Drayton, from where I was eventually demobbed in October 1946. So that was the end of my Air Force career. I was, by then, a Warrant Officer (T) with more than 6 years’ service. I was awarded 39-45 Star Aircrew Star with France and Germany Clasp and the two normal service medals.